Flexzilla® is a revolutionary hose featuring a Premium Hybrid Polymer material that redefines flexibility. Flexzilla® hose characteristics offer zero memory allowing it to lay-flat exactly where you drop it and won’t work against you during operation or coiling after use. Flexzilla® offers extreme all-weather flexibility, even in sub-zero conditions. Flexzilla® is currently in use by oil companies located in Alaska! Flexzilla® Air Hoses offer superior flexibility for tight radius bends in both cold and warm environments. Extreme all-weather flexibility, even in sub-zero temperatures! 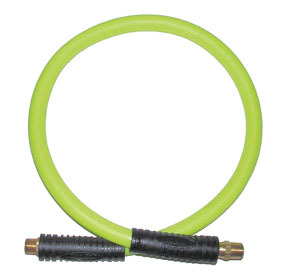 Includes bend restrictor that reduces wear and tear, prolonging the life of the hose. Size: 1/2 in. x 2 ft.